Interferon-Regulated Translation. 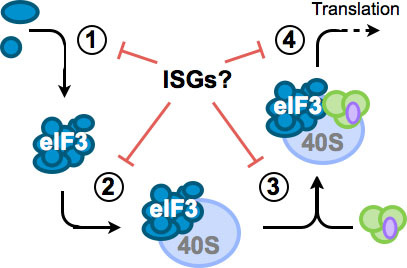 Interferon stimulated genes (ISGs) regulate translation at multiple steps via poorly understood mechanisms. The cellular response to pathogen infection involves expression of hundreds of genes designed to disrupt the native host environment and limit microbial replication. This network of interferon-stimulated genes (ISGs) dramatically alters cellular pathways to create a temporarily nonpermissive state that is broadly resistant to viral, bacterial and fungal infection. All viruses rely on the endogenous host system for mRNA translation, and many ISGs function by targeting key regulatory steps during protein synthesis. Through in vitro reconstitution of ISG activity, we aim to biochemically and structurally characterize novel ISGs that poison the cellular translation machinery. Dysregulation of protein synthesis is also critical in cancer and uncontrolled cellular proliferation. In addition to revealing how organisms defend against microbial replication at the cellular level, mechanistic understanding of how ISGs manipulate canonical mRNA translation may provide new insight into inhibition of oncogenic pathways and disease.